Valerie Neilson, TPA Deputy Director of Multimodal Development, (center) presented on the future of transportation in Palm Beach County at the March 26 general membership meeting of the Conference of Minority Transportation Officials (COMTO), Palm Beach County chapter. To learn more about the national multimodal transportation organization's opportunities and member benefits, go to COMTO.org and please email the local chapter at COMTO@gmail.com. The Palm Beach TPA has posted materials from a Florida Dept. of Transportation (FDOT) workshop held on Feb. 28, to the following TPA web page: PalmBeachTPA.org/SR710. Included are a project flyer, presentation slides, and a presentation video that includes animation to portray complex traffic flows from various directions. I-95 Interchange and Northlake Blvd. The Florida Dept. 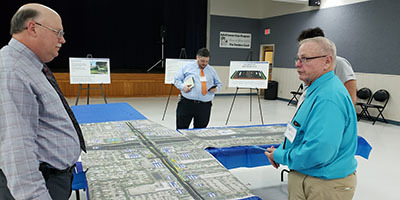 of Transportation (FDOT) held an open house workshop on March 26 to discuss proposed modifications to the interchange at I-95 and Northlake Blvd., and along Northlake Blvd. from Military Trail east to Silverthorne Drive. 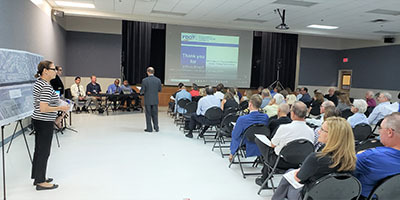 For project details, maps and schedule, go to the FDOT project website at 95Northlake.com. Click here to review details of upcoming FDOT meetings and proposed projects in FDOT District Four which includes Palm Beach County. The Palm Beach TPA welcomed Port of Palm Beach Commissioner Joseph D. Anderson as the Port's newly appointed representative to the Palm Beach TPA Governing Board. 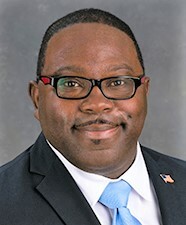 Commissioner Anderson joined the Port of Palm Beach Board of Commissioners in January 2019, and currently serves as the Port's Secretary/Treasurer. 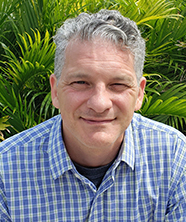 In February, the Palm Beach TPA welcomed Jason Price as a Lead Planner who will serve as Coordinator for the Transportation Improvement Program (TIP). A native of Binghamton, NY, Jason graduated from Pace University (Pleasantville, NY) with a Bachelor of Business Administration. From Binghamton University, Jason earned a Master of Arts in Geography and a Master of Public Administration. Jason has more than ten years of work experience in Florida, Pennsylvania and California, where he most recently relocated from Eureka, CA, after working for three years with the CA State Dept. of Transportation. Jason is designated by the American Planning Association (APA) as a member of the American Institute of Certified Planners (AICP), and is certified by the Institute of Transportation Engineers (ITE) as a Professional Transportation Planner (PTP). 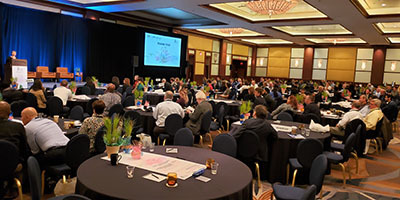 On February 25-26, 2019, the Miami-Dade Transportation Planning Organization (TPO), the Broward Metropolitan Planning Organization (MPO), and the Palm Beach Transportation Planning Agency (TPA) came together to host the 2019 Safe Streets Summit in Miami. Look for the "Archives" tab at SafeStreetsSummit.org to view presentation videos and additional conference photos. The planning committee has already met to begin the year-long planning process for the 2020 Safe Streets Summit to be held in Ft. Lauderdale. 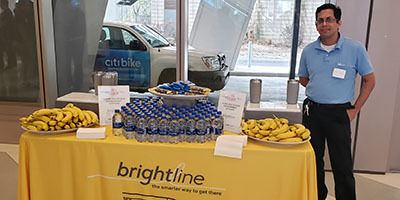 Participants included hundreds of transportation professionals, elected officials, community partners, and other advocates of safer, complete streets and improved access to multimodal transportation. 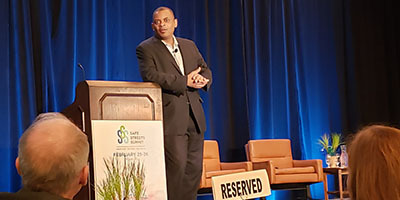 The two-day event included a full conference day featuring nationally-recognized speakers including former U.S. Transportation Secretary Anthony Foxx (currently serving as the Chief Policy Officer at Lyft). 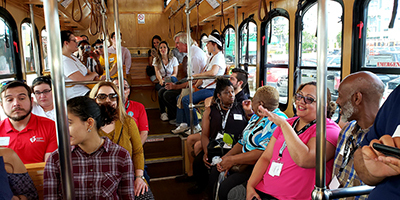 Five mobile workshop tours were held the second day to highlighted transportation and built environment efforts that promote economic development, livability, and access to local and regional transportation options. 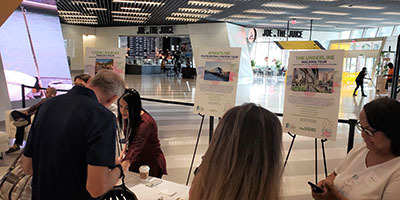 Mobile workshops began at the Brightline MiamiCentral station to tour the City of Coral Gables, the City of Miami Beach, Downtown Miami, The Underline, and the Brightline MiamiCentral station. 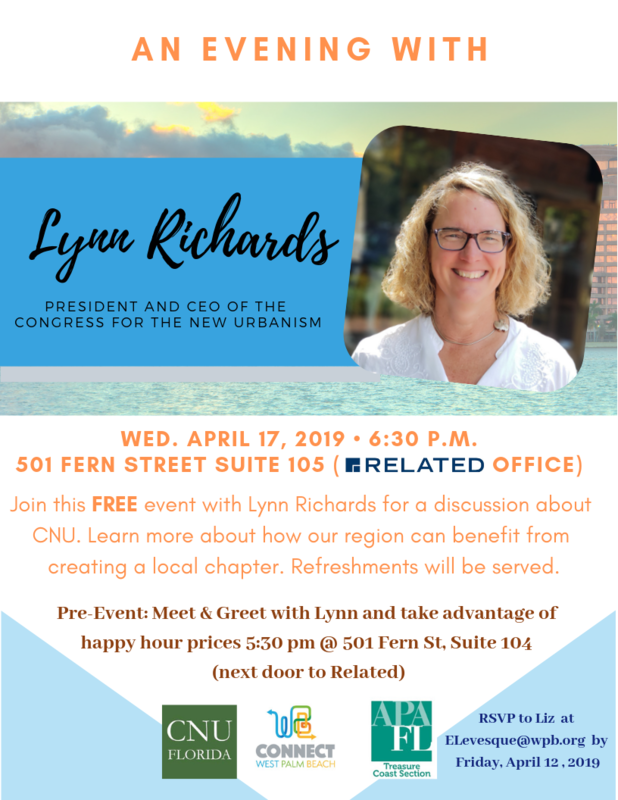 The City of Coral Gables conducted a trolley ride through neighborhoods where complete streets improvements had been made and a walking tour through the improved business district. 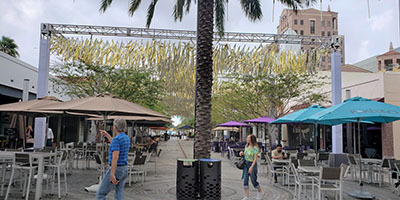 Metallic streamers overhead in Coral Gables create a sense of place, while adding shade, movement and a sound in the breeze. 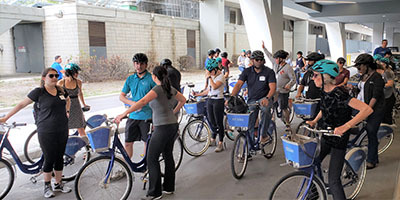 Some mobile workshop participants toured the Miami area on bikes. 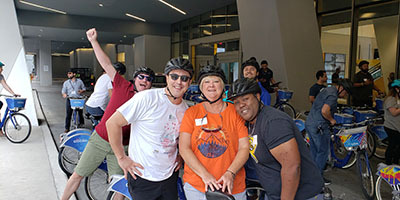 TPA staff members Michael Lynch (left) and Nicholas Hernandez (center) biked downtown Miami along with Kim Glas-Castro who represents Palm Springs as an alternate member of the TPA Technical Advisory Committee. Meeting of the Palm Beach TPA Governing Board in the Village of Palm Springs held on March 21.